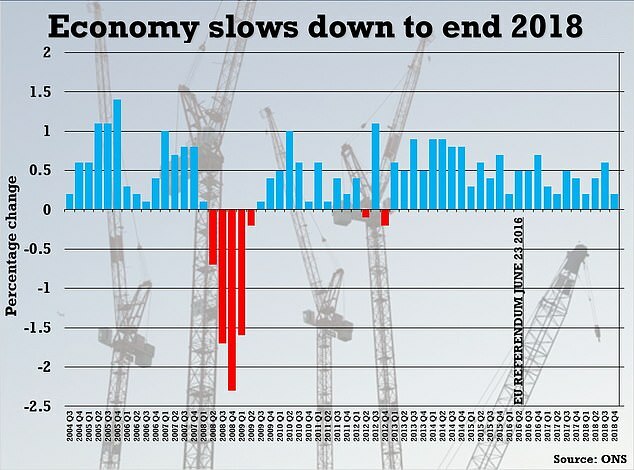 The UK’s economic slowdown continued in the final three of months of 2018 as growth fell to just 0.2 per cent. The figure for October to December – fuelled by the steepest decline in car manufacturing for a decade – compares to 0.6 per cent in the previous three months. The latest quarterly figures were hit by a particularly slow December, which saw growth fall by 0.4 per cent overall, including a 0.7 per cent plunge in manufacturing. Monthly GDP figures are generally more turbulent than quarterly data. It means Britain’s economy grew by just 1.4 per cent in all of 2018, the worst year since 2009 and the aftermath of the financial crash. The economy was boosted in the summer by sustained warm weather and the World Cup, the Office for National Statistics said. Sterling tumbled following the news, dropping 0.4 per cent versus the US dollar to 1.28. Against the euro, the pound was down 0.1 per cent at 1.14. 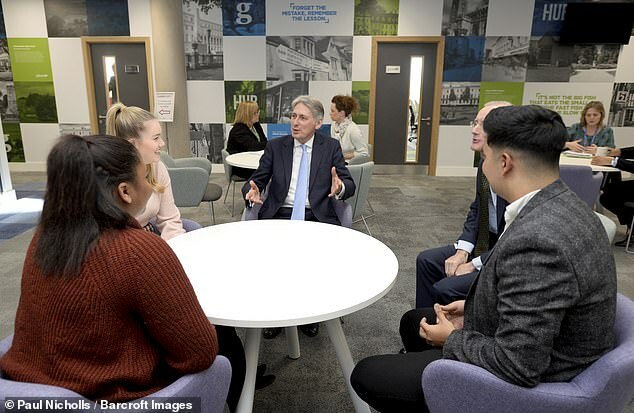 Chancellor Philip Hammond said: ‘The UK’s economy continues to grow and remains fundamentally strong. ‘Growth of 1.4 per cent in 2018 means the UK has grown every year for the past nine years and the OBR expects it to continue growing in every year of the forecast. Shadow chancellor John McDonnell: ‘The evidence is mounting that the combination of the Government’s shambolic handling of Brexit and nine years of austerity is causing real damage to our economy. ‘Business investment has been falling for months now, as uncertainty and the fear of No Deal cause immediate damage to confidence. ‘Six consecutive months of decline for the manufacturing sector hasn’t happened since 2009. 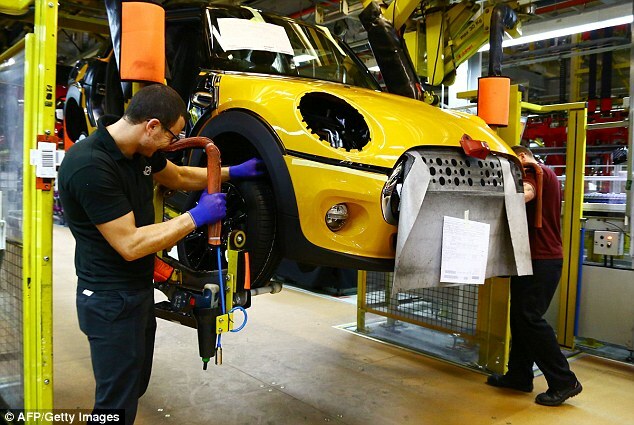 Car production was down 4.9 per cent in the period, marking the biggest decline since the first quarter of 2009. Total production output slipped by 1.1 per cent, the largest decline since the end of 2012. This included a 0.9 per cent dip in manufacturing. Construction was also lower, dropping 0.3 per cent in the fourth quarter. This follows two consecutive quarters of growth during the summer, when companies caught up with work delayed by adverse weather early in the year. Although services output was up, growth slowed to 0.4 per cent following a relatively strong performance during the summer. 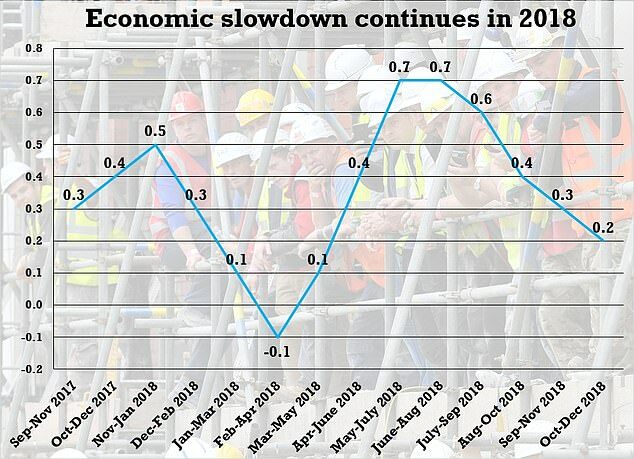 Rob Kent-Smith, head of GDP at the ONS, said: ‘GDP slowed in the last three months of the year with the manufacturing of cars and steel products seeing steep falls and construction also declining. However, services continued to grow with the health sector, management consultants and IT all doing well. ‘Declines were seen across the economy in December, but single month data can be volatile meaning quarterly figures often give a better indication of the health of the economy. Compared with the same quarter in 2017, the UK economy is estimated to have grown by 1.3 per cent, the weakest in six years. It was last weaker in the second quarter of 2012. On a month-to-month basis, GDP fell 0.4 per cent in December. This was the biggest monthly drop since March 2016.